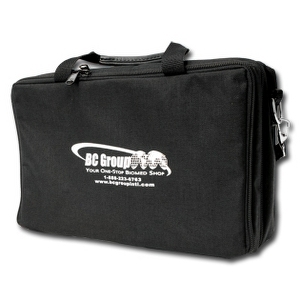 This medium-sized, black cordura, padded carrying case is ideal for any product that needs to be carried or stored. The dual zippered compartments give you enough room for the testing equipment in the large compartment plus the manuals and cables in the second. Comes with a detachable divider for the large compartment and a detachable shoulder strap. Overall Dimensions: Length: 12" ; Width: 8" ; Height: 5"
Large Compartment Dimensions: Length: 12" ; Width: 8" ; Height: 2.5"
Small Compartment Dimensions: Length: 12" ; Width: 8" ; Height: 1.5"